Beautiful detached villa on one floor only 300 mts away from the beach and within easy walking distance of local shops, bars and restaurants. With 8x4 mts private pool and stunning sea and mountain views from covered terrace and pool area. Very private and walled plot. 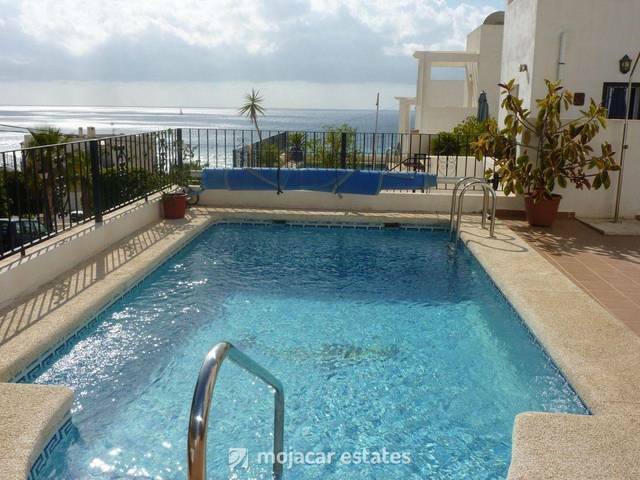 Casa Elena comprises 2 bedrooms with double bed and 3rd bedroom with 2 single beds. Each bedroom has its own bathroom en suite. For infants there are 2 folding travel beds available. At the rear of house there is a swimming pool with outdoor shower, terrace with BBQ and dining table and chairs. -kitchen complete with gas oven and stove, fridge, freezer, dishwasher, microwave and toaster. Very quiet neighborhood in a residential area consiting of detached houses and villas.